Founders of the Situationist International at Cosio d'Arroscia, Italy, April 1957. 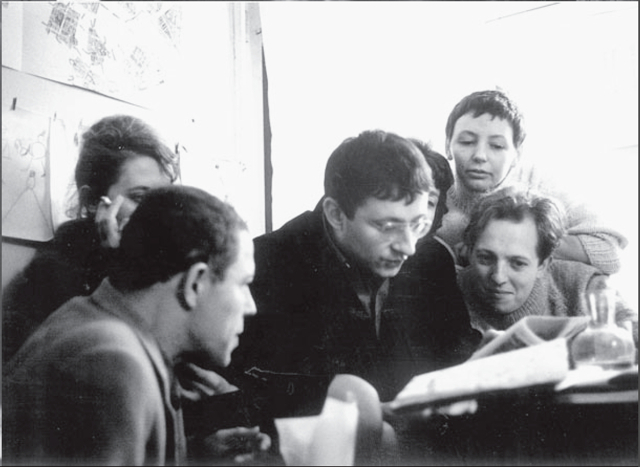 From left to right: Guiseppe Pinot Gallizio, Piero Simondo, Elena Verrone, Michele Bernstein, Guy Debord, Asger Jorn, and Walter Olmo. Conference in Munich, April 1959. 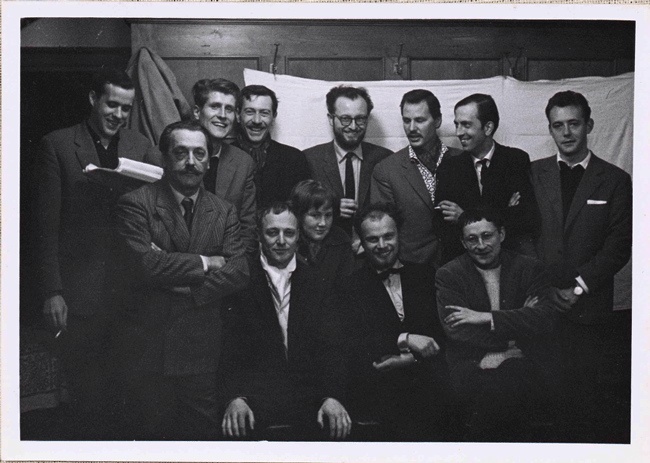 From lefto to right: Giors Melanotte, Giuseppe Pinot-Gallizio, Hans-Peter Zimmer, Maurice Wyckaert, Asger Jorn, Gretel Stadler, Helmut Sturm, Heimrad Prem, Armando, Constant, Guy Debord, Har Oudejans. The SI at the Institute for Contemporary Art, London, 1960. 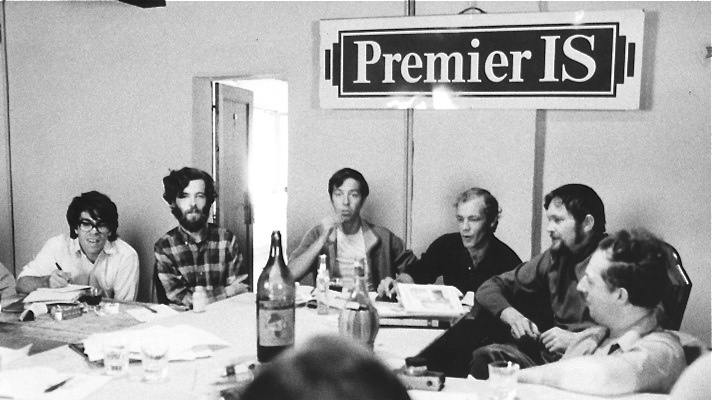 Standing, from left to right: Maurice Wyckaert, Asger Jorn, Jacqueline de Jong, Hans Peter Zimmer, Heimrad Prem, Helmut Sturm, Katja Lindell, and Jorgen Nash. Sitting, from left to right: Attila Kotyani, Guy Atkins, and Laurence Alloway. Conference of the SI at Goteborg, Sweden, 1961. From left to right: J.V. 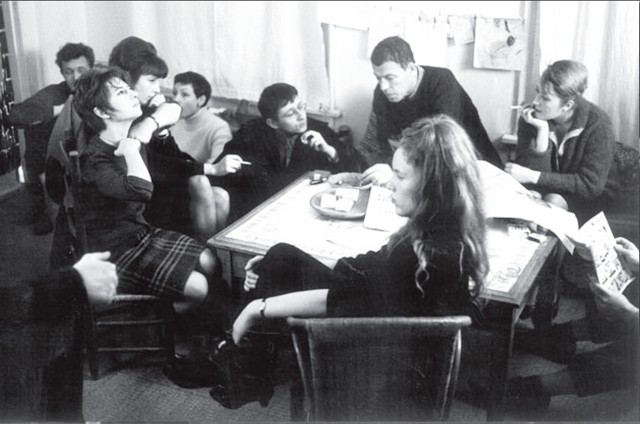 Martin, Heimrad Prem, Ansgar Elde, Jacqueline de Jong, Guy Debord, Attilla Kotyani, Raoul Vaneigem, Jorgen Nash, Dieter Kunzelmann, and Gretel Stadler. Conference of the SI at Antwerp, Belgium, 1962. Left to right, facing us: Raoul Vaneigem, Therese Vaneigem, Michele Bernstein, Attila Kotanyi and J.V. Martin. Guy Debord is next to Vaneigem with his back to us. Conference of the SI at Antwerp, Belgium, 1962. Left to right: Attila Kotanyi, Guy Debord, Michele Bernstien and Raoul Vaneigem. The name of the woman at left isn't known. The woman between Debord and Bernstein is Therese Vaneigem. Conference of the SI at Antwerp, Belgium, 1962. Left to right: J.V. 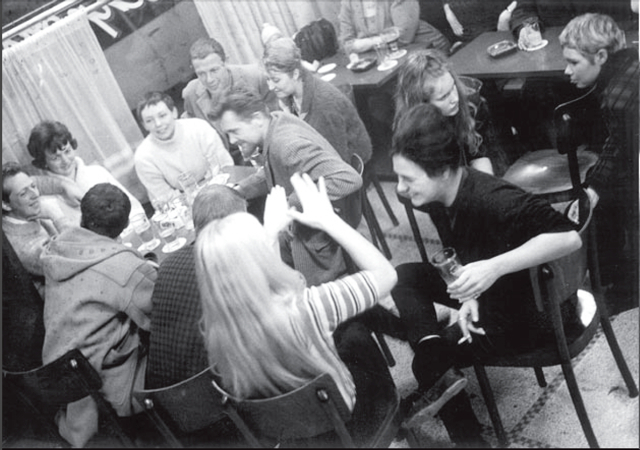 Martin (partially obscured), Jenny, an unknown woman, Michele Bernstein, Guy Debord, Attila Kotanyi and two unknown women. Conference of the SI at Venice, Italy, 1969. From left to right: Eduardo Rothe, Bruce Elwell, Robert Chasse, Tony Verlaan, J. V. Martin and Raoul Vaneigem. Conference of the SI at Venice, Italy, 1969. 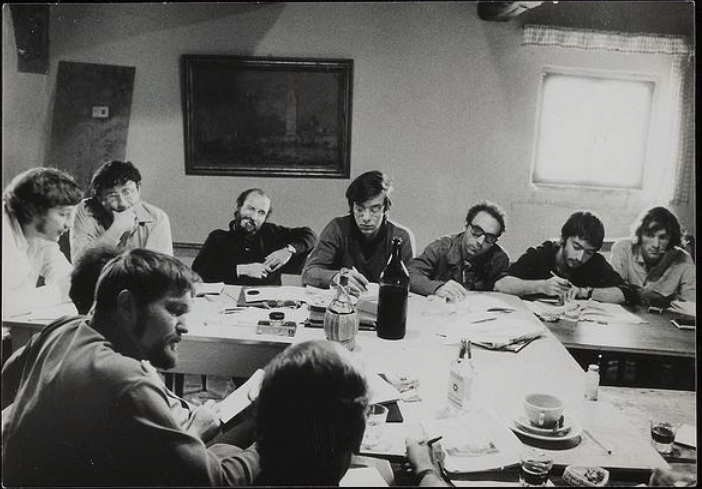 From left to right: Rene Vienet, Guy Debord, Claudio Pavan, Paolo Salvadori, Mustapha Khayati, Rene Riesel, and Alain Chevalier. In foreground: Raoul Vaneigem (almost completely obscured), J. V. Martin and Tony Verlaan (back of head).